Let’s get this straight from the start, Clones, from TomKorp Computer Solutions, is a Lemmings.. well.. clone. Very aptly named. Not that this is a bad thing, I quite liked Lemmings when it came out, as well as all the other reincarnations of the familiar scenario. To be brutally basic, you guide your cute, colourful aliens (the Clones) which resemble for all the world left over ear lobes, from one end of the terrain to the next without losing too many of them on the way. How you do this depends on what morphing capabilities you have available, and by morphing, I mean you have the ability to turn your clones into a variety of workers whose roles can include chomping through the landscape at an angle, drilling down, building steps, flying or sacrificing themselves for the greater good and benefit of the other Clones. Very brave. The levels, and there’s plenty of them, over one hundred and fifty! 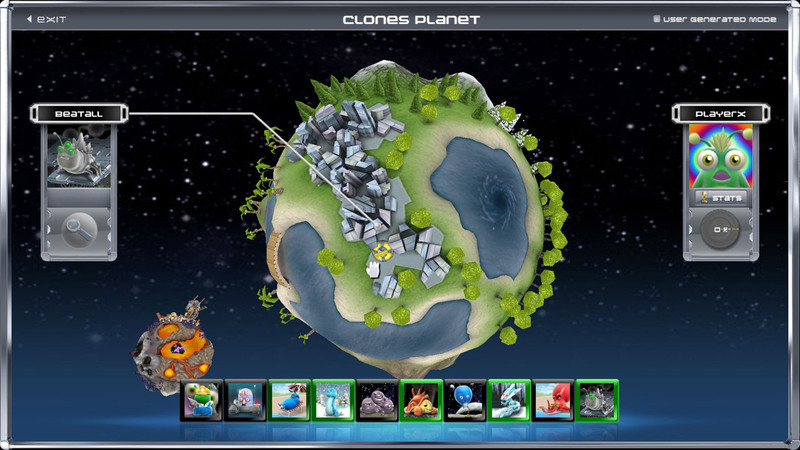 Are split into different regions on the alien planet, each controlled by a Clone Master and each having their own unique puzzles and environments. The Clone Masters are an odd bunch, with a Driller Dude, an alien in a glass jar looking thing and an octopus clone alien looking creature amongst their ranks, they range from the weird to the eccentric. However, they serve the purpose of setting you challenges. If you can ‘beam up’ a set number of clones on that level then you have won. It’s not always quite as easy as that, each level has a little twist in it to keep you on your toes. For example, you might have to guide your purple Clones to a particular area to throw a switch, freeing a green Clone, then you have to build, dig, or fly your way over to the teleporter to beam up the green Clone only. 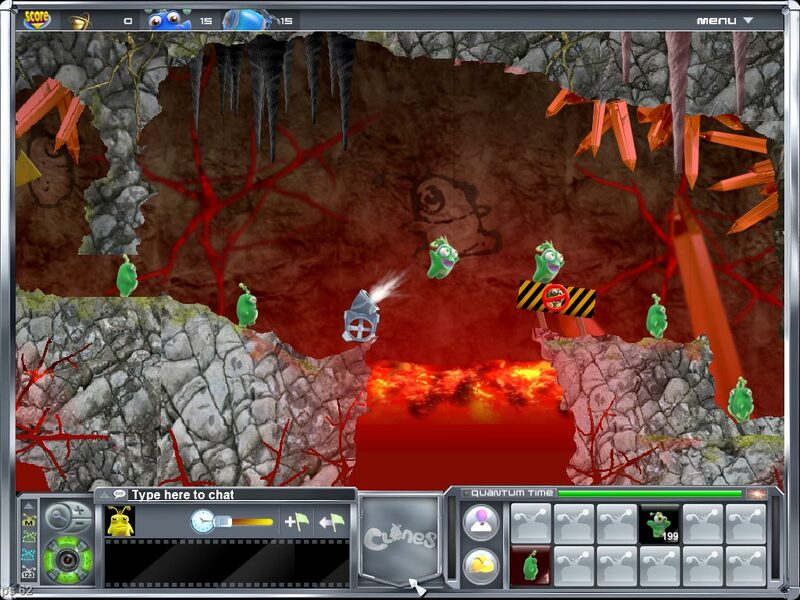 Other levels require you to rescue the giant Clone, or collect an object and transport it from one end of the landscape to the other. There are also objects to collect in the form of Quantum Dots. It’s not mandatory to collect these objects, but doing so can unlock bonus items, such as decorations, extra morphing abilities and hidden levels. If you reach the end of the Clone Master’s level then you have the chance to go up against the Clone Master himself. If you manage to beat him then you can begin to piece together the Clone Master Medallion, a bit like a Jim’ll Fix It Badge, but bigger, and without the scary looking Jim doing his ‘Now then, now then, little Timmy here…’ Once you collect all the pieces you can then go up against the Super Master Clone, a truly formidable opponent, and don’t worry, it’s not Jimmy Saville, but not far from it, how about a kind of peace-loving hippy monkey Clone? As far as the single player levels go, that’s really it. Luckily, the developers have added a few other extras into the cooking pot. You can design your own levels, package them and publish them on the Clones website. You can create your own avatar Clone, complete with designer antlers and other body parts. You can login to the website via the game and upload your scores to see how you fare in the world rankings. You can even play a variety of multiplayer maps with up to sixteen players. Clones is really quite a work of art and a lot of development time has gone into the customisation features of this, surprisingly good game. The graphics are very bright and colourful, with the Clones themselves animated in a kind of 3D aspect. The landscapes are bold and have a good use of effects programmed into them, waves on the water, lava spits out flames etc. The music is a nice bubbly sort of affair which ties in neatly with the bouncy, cartoony graphics. The sound effects are pretty good, with the same kind of happy, bubbly theme as the music. The levels are suitably created to give a decent challenge and the ability to create your own or download someone else’s provides that little extra something that keeps you playing. Of course, the hidden extras also make you want to unlock the secrets behind the Master Clones and no doubt someone will want to be the first to collect all the art work and bonus items and score a perfect 100% across all the levels. The tutorial, or first few levels, are easy to get into and lead you quite nicely into the game mechanics and objectives. Each progressive level represents a jump in difficulty, but not too much so younger players will be put off. That doesn’t mean the adults will get bored too quickly, it just means it’s a good all round family puzzle game. I enjoyed Clones, it was bright, breezy and fun to play and can be windowed, so you can play it with the sound off instead of doing some work! But don’t tell anyone I said that. To be fair though, after all the extras and nice looking updated graphics and sounds, it’s still just a Lemmings clone. If you like that type of thing then great, if not then Clones isn’t going to grab your attention. But if you fancy a few hours of puzzling then get it from GetGamesgo.com. It’s only about £3.50 or something, so a really good buy. Good review, but the best part of Clones is the online multiplayer which you barely mentioned. When you play against someone the game morphs from puzzle to RTS and gets intense. True, quite true. My error for not mentioning it, but it was a case of ‘is there anybody out there’ when I tried to look online. I tried again tonight and found a couple of servers running after the update – perhaps I was just unlucky, thanks for pointing it out though. Dave.